Party Time Tuesdays: PTT#42-Sketch AND/OR Thank you, Giving Thanks, or Being Thankful. PTT#42-Sketch AND/OR Thank you, Giving Thanks, or Being Thankful. Good morning! Welcome to another PTT challenge! WOW, I cannot believe the amount of bling from our challenge last week! Can't wait to see who the winner will be! Come back next Monday for that announcement. Now for this weeks challenge...you can use our sketch AND/OR Thank you, Thankful, Giving Thanks, Gratitude! Anything to do with "Thank You"! Viva Decor world headquarters and production facilities are located in Bad Salzuflen, which is situated in the eastern part of North Rhine-Westphalia, Germany. Here new ideas are born, new products are developed, tried and tested and delivered to the international market. Our wide product range includes colors and modeling materials for home decoration, for product design, and accessories for all types of craft projects. Viva Decor is managed by Ingrid Pott and Andreas Franken. For them creativity and innovation build the basis of the company. They have built Viva's reputation on product quality and reliability, combined with ongoing development and improvement. All viva products are crafted with the customerâ€™s needs in mind. Viva Decor products can be found at craft and art supply retailers throughout the world. All America Supply DBA Viva US is the exclusive US distributor for all Viva products. Viva US provides the Viva Decor product line with domestic US Inventory, shipping, and packaging from our large climate controlled PA warehouse. Viva US provides customer service, support and product education nationwide from our Philadelphia location. anaRydesign is a design house of scrapbooking and craft products. It is also the home of the ‘Gilli’ line of deep-etched rubber stamps. ‘Gilli’ is a collection of rubber stamps for you to make your own. Endless creativity is in your hands! Bring Gilli with you on your journey into the imaginative and artistic world of paper crafts and let her join in on the fun! This week the Party Planners are using Viva Decor Embossing Creme, Glitter Liner, and Pearl pens! Thanks Viva Decor!!! Here are the Party Planners with their version of the Sketch and Giving Thanks!! Please remember to follow our rules if you would like to have a chance to win one of the above prizes from our fabulous sponsors. Lovely challenge, might come back with an entry for the sketch too which I love the look of. Thanksgiving creations by you & your DT. Entered my Thanksgiving Mini Card. Thanks for the fun challenge! I LOVE VIva Decor pens - saw them in a stamp show recently and there were AWESOME! Thanks for the chance to win some. Lovely samples fro the DT. This was a wonderful sketch. Thanks for creating it, as I wouldn't have thought all the details out as carefully, and the balance is beautiful! Everyone's cards are inspirationally lovely. Thanks for the fun challenge! lovely cards by the DT here! Love the sketch,very detailed. Thanks for publishing such great challenges. I enjoyed this sketch! The DT's creations were inspirational and beautiful. 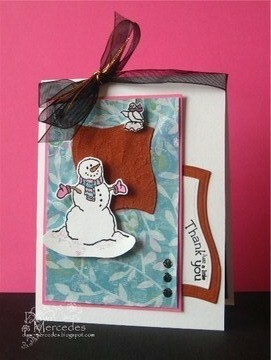 I am working on my Snow card!